This picture is from April 2007. When I took it I made a list of things Baylie had told me that day. Things that were important to her, like helping people, spending time with her family, and doing homework. Now I seem to have lost that list so this becomes just a picture. 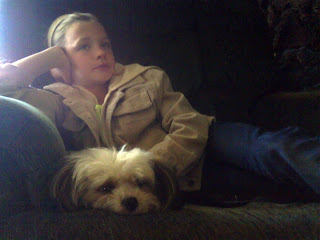 A picture of a Dog named Daisy and a girl named Baylie. My loving, Giant-hearted, special little niece, Baylie. I am a better person for knowing her. It is surprising what you can learn from a nine-year-old who puts others before herself. Nice job, Baylie. You make us all proud.